ACL Launchpad gives you access to all the latest ACL software releases, as well as a goldmine of new resources in one place. With so many exciting additions to the ACL ecosystem, it’s time we provide customers with a convenient, one-stop login experience, so that you can take advantage of all the free resources available to you. 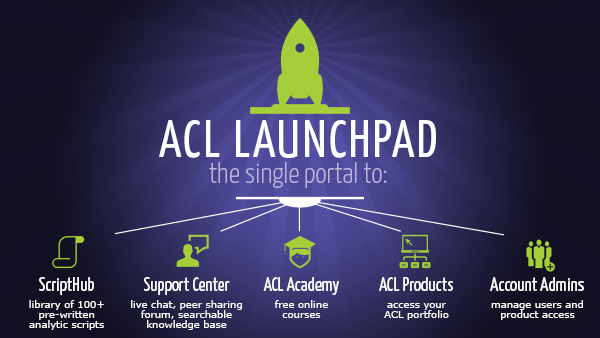 ACL Launchpad is now the single sign-on portal to access all of your ACL software and services (including the ACL Support Center, user forums, product documentation, online training, and more!). Join ACL’s Shane Grimm, Senior Product Technical Manager, Analytics and Benedicta Chan, Support Services Representative as they guide you through “the new world of ACL,” where you are part of a global community of the world’s most sought after audit, risk and compliance professionals. In this 60 minute webinar, our panelists navigate you through Launchpad activation and set up using live demo, and highlight many tips & tricks to help users find their way around. > View the at-a-glance infographic: What’s in your Launchpad?